New York knew for a long time that a big storm could flood and collapse the subway system, which is exactly what happened with Sandy. Yet city officials did nothing about it. But now, after all the suffering, we'll finally be prepared. 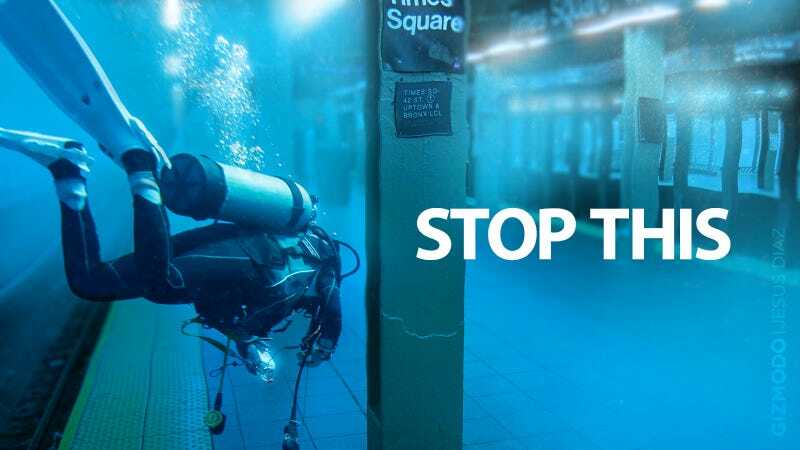 With an estimated $50 billion lost due to Sandy—$5 billion on transportation infrastructure alone—the MTA has painfully found out that not investing in prevention is a lot more expensive than hoping you will be lucky. Something that was as stupid then as it is obvious now. On a rainy day, the pump system is absolute chaos, to the point where the MTA-NYC's Metropolitan Transportation Authority-lives in permanent panic, fearing events like Sandy, the hurricane system that is approaching the little town right now. "At some point, it would be too much to handle," said the head of the hydraulics team back in 2006, Peter Velasquez Jr., "you've got rain plus wind. It basically would shut down the system. You hope not. You pray that it doesn't. "To give you an idea about how bad this could be, some of the oldest pumps in the NYCTA system were bought second-hand from the builders of the Panama Canal. I worked for the TA many years ago and even then the pumps were considered a serious problem." The Panama Canal was finished in 1914. One of the solutions, the NY Daily News reports, is inflatable bladders. Basically, a giant inflatable plug that would be deployed to key points of the subway tunnels all over the city. Before the storm hits, train service will stop, and the bladders will be inflated, perfectly covering the tunnel and avoiding the flood. It's an incredibly obvious idea, but one that works apparently could work perfectly. It was developed by engineers at West Virginia University using funding from the Department of Homeland Security. Called the Resilient Plug Project, the cost of the plugs is $400,000 a pop. That seems expensive, but is nothing compared to the money these will save. Remember: the MTA's estimated Sandy damage was five billion dollars. According to its creators, the Resilient Plug Project will withstand a thousand gallons per minute, according to their latest test. But the bladders couldn't be used in every tunnel, which is why there will be another options, like giant steel gates that work like submarine doors. According to the Daily News, the Port Authority is going to spend $181 million in building these doors in the PATH network, the train tunnels connecting Manhattan with Newark, Harrison, Hoboken and Jersey City under the Hudson river. The system runs for 13.8 miles (22.2 km) and carries a quarter million passengers every day. The gates will arrive too late for Sandy, obviously, and may also be too late for the next frankenstorm: after many years of design, they are scheduled to be finished in 2014. The gates were designed to stop damage in case of a terrorist attack, but they will also work to stop natural disasters—a much more likely event. According to a Port Authority spokesman, "although not designed for that, in all probability they would stop flooding from a surge." Don't think that these solutions will make the city flood-proof. Talking to Times Free Press, Rice University's Phil Bedient "you really have to go with a series of levels of protection." Bedient, who worked on a submarine door system to protect the university's medical campus tunnels, says that you have to pick your spots carefully and, even then, "you really can't protect everything." We don't need full protection, though. We need systems that are good enough to prevent major destruction, and to get the city transportation system back up and running within a few hours. That's what these bladders and submarine doors can do. And we need them now, before the next Sandy strikes.